Our #GoingSocial strategy - to build collaboration and unlock the knowledge trapped inside our enterprise cyber walls - was based around that very feedback. We began proselytizing #GoingSocial in February. In early March, we launched the sexiest part of the campaign = Gamification. We implemented Bunchball’s Nitro for Salesforce (N4SF) with the goal of incentivizing internal and external collaboration (points, badges, and tangible rewards for social actions such as Chatter posts and comments, publishing a blog post, adding and creating social profiles, sharing Bluewolf content to external networks, adding content to Salesforce, etc). 1. 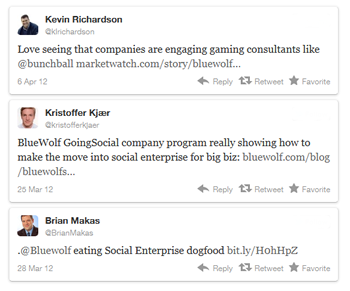 Our corporate Bluewolf Klout score, steady for several months at 42, shot up to 45 since the #GoingSocial launch. This signals an increase in our online influence as it measures engagement with our brand (e.g. mentions of @Bluewolf and retweets). This result is due to the increased Bluewolf content sharing by our employee base and their subsequent connections. 2. The average use of Chatter within Bluewolf has significantly spiked since the launch. Check out the graph below that represents the average user’s Chatter Activity (posts, comments) over the past 2 years. Note the average activity in particular for the last two months. 3. Our website traffic from social media (including Twitter, LinkedIn, Facebook, Pinterest, SlideShare, etc) has doubled since implementing Bunchball in early March. The “Spread the Word” feature in Bunchball’s N4SF has significantly helped our end users easily share Bluewolf content via their external networks from within Salesforce. With the positive results we’ve seen thus far, what have been the motivating factors for user adoption? #GoingSocial is garnering support. The challenge over the coming months will be to maintain the enthusiasm and participation. User feedback will be central in this effort. Follow our popular Pinterest board for the latest updates on our #GoingSocial program. Learn more about our #GoingSocial service offering.